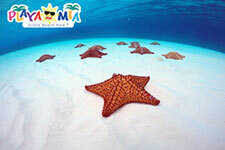 With white sand beaches & colorful starfish, El Cielo day trips are one of the most popular things to do in Cozumel. Known as one of Cozumel's hidden gems, El Cielo is a secluded sanctuary with colorful starfish a world-class destination. Explore this special place on one of our popular snorkeling tours. Slip on a snorkel and a face mask, and submerge yourself into a magical underwater world. Time seems to disappear as you float through the warm, crystal-clear Caribbean waters. Welcome to El Cielo ("The Sky"). Named after its piercing blue color and abundance of starfishes, this secluded sanctuary is the perfect place to experience some of the Caribbean's best snorkeling. Located right off the island of Cozumel in a shallow, protected area, El Cielo is only accessible by boat – and we can take you there. Our popular, five-hour Cozumel Snorkel Tour takes you to this celebrated diving spot. Follow your PADI-certified guide and explore the incredible El Cielo. For many visitors, it's the highlight of their trip to Mexico. Back on board the boat, you can order a well-deserved margarita rum punch or beer before landing at Playa Mia Grand Beach & Water Park. With 20 free attractions, our epic coastal playground is home to some of the most popular things to do in Cozumel. Hit up the all-you-can-eat buffet, relax by the pools, and take a thrill ride down our massive slides. Would you like to book our Cozumel Snorkel Tour? Please contact us for more information about our unique beach park's attractions and special vacation packages.